First things first. Yes, 90-cent hamburgers! It’s a deal with a one-day-only shelf life: Dec. 5. The occasion? 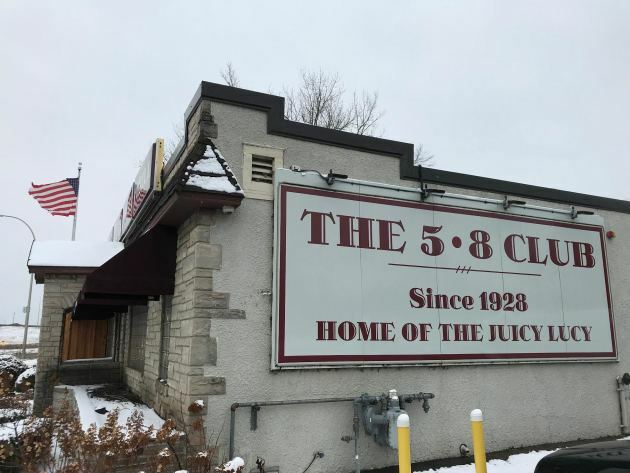 To mark the 90th birthday of the 5-8 Club in south Minneapolis. Those 90-cent burgers will not be the kitchen’s signature cheese-stuffed Juicy Lucys (pictured, above); they’ll be the menu’s classic, single-patty iteration. For the few Burger Friday followers who might be perplexed by the words “Juicy Lucy” (or its alternate spelling, “Jucy Lucy”), it’s Minnesota’s contribution to the burger pantheon, a kind of extra-thick, inside-out cheeseburger, where a pair of patties are pinched around a small amount of cheese. At the 5-8, each Juicy Lucy patty (“Fresh, never frozen,” said Skogheim), weighs in at a quarter-pound, and the cheese options are American, blue, pepper Jack and Swiss. The grill’s heat turns the cheese into the dairy equivalent of volcanic magma. No wonder my all-smiles and whip-efficient 5-8 server offered this sage bit of advice: “You might want to let it sit for a few minutes before you take a bite,” she said, a ploy that allows the dangerously hot molten cheese to attempt to return to its more palatable solid form. Duly noted. 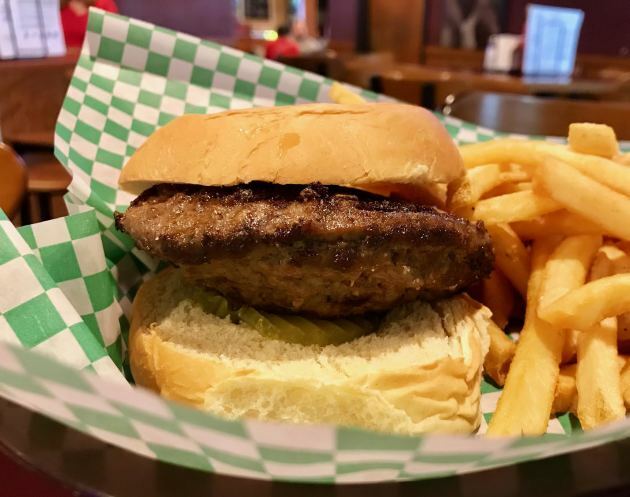 There’s a raging controversy over the cheese-stuffed burger’s origin story: was it created at the 5-8, or at another south Minneapolis dive bar, Matt’s? Someday, historians will uncover the truth. Skogheim is a 20-year 5-8 veteran, starting as a college intern. One of her duties back then was to make the daily trek to the meat counter at GJ’s Supervalu on nearby Chicago Avenue (it’s now a Kowalski’s Market) and pick up the day’s ground beef order. (By the way, a wholesale meat purveyor now supplies the 5-8’s ground beef). It’s hard to imagine today, but when what is now the 5-8 opened on 58th Street and Cedar Avenue in 1928, the location was considered to be out in the country, a beyond-the-limelight location suitable for its not-so-legal shenanigans. For context, consider this: at the time, the Foshay Tower, which would be the city’s tallest building for the next 40 years, was under construction. When Prohibition was lifted – on Dec. 5, 1933 -- the 5-8 went legit, and added a kitchen. Skogheim believes that the Juicy Lucy came along sometime during the 1950s. Back to the big bash. Along with those 90-cent burgers, the 5-8 will celebrate on Dec. 5 with 90-cent beers (a Leinenkugel’s ale), along with 90-cent fries and 90-cent onion straws, the kitchen’s onion ring-like delicacy. “We’re also tapping a keg of Bent Paddle Brewing Co.’s Old Fashioned,” said Skogheim, referring to the Duluth brewery’s bourbon barrel-aged beer with cherry and orange accents. Sadly, it’s the one celebratory option that’s not priced at 90 cents. There’s also a freebie alert: As long as supplies last, Skogheim and her crew will also be handing out birthday cake, gratis. Expect a crowd.